At School of Fish we offer scuba lessons on Long Island year round. 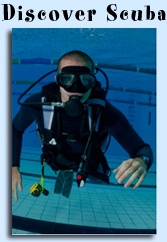 We are affiliated with PADI, the industry leader in dive training. This is an entry level certification course. There are three training segments that need to be completed before you get your certification, they are; eLearning (10 to 15 hours of work), Pool Training (anywhere from 4 to 6 hours on average), Open Water Training (4 dives in the open water). You can start this program any time anywhere. Once you have enrolled in our eLearning program you can call us to arrange your pool training. Please give 2 weeks notice to schedule pool training, otherwise this will be considered private training and will cost an additional $100.00. Once you have completed your pool dives you can then sign up for the four open water training dives. We offer this training from early June through early November (weather permitting). If you want to complete these dives elsewhere, maybe in a warm environment during the winter months or with another dive school anywhere in the world you can do that as well. We will issue the paperwork needed for you to do that. We strongly encourage our students to complete their scuba lessons on Long Island if possible. This course is sort of a stepping stone that gets you on the way to becoming an Advanced Open Water Diver. It consists of three “Specialty” dives. A specialty dive is a dive where you work on a certain task or skill such as; Navigation, Photography, Buoyancy Control, Night Diving, Wreck Diving, Dry Suit Diving, Search and Recovery etc… You can start this program any time by enrolling in eLearning here, make sure you choose the Adventures in Diving Option. Once you sign up start looking at the different specialties you think you might like to try. Some of the most popular ones for local diving are; Navigation, Buoyancy, Night, Search and Recovery, Boat, and Wreck. Once you have completed the eLearning modules for the specialties that interested you a single dive will be made for each specialty. We schedule these several times throughout the dive season so check our schedule or call us to do them privately. We encourage you to get this certification as soon as you can after completing your Open Water class. AOW consists of 5 specialty dives (as described above in Adventure Diver). There are two “core” dives in the AOW program, you must make a night dive and a deep dive. The other three specialty dives are of your choice and if you started the Adventure Diver program you might already have some or all of them done. This program is only offered during the summer but you can sign up for eLearning any time. It works the same way as Adventure Diver, complete the eLearning segments pertaining to the dives you will be doing and then make the dives. Once you earn the AOW certification you will then be able to dive beyond the recommended 60 foot depth limit of an entry level Open Water Diver. This class is a great way to hone some of your existing skills but you will also develop a whole new skill-set. Rescue diver can be like a launching pad, for many it is the first step toward earning the “Professional” rating of Divemaster (Rescue is a prerequisite). For others it can be like the finish line, it might just be the last hurdle they need to clear while earning the highest recreational certification level of Master Scuba Diver. Whatever your motivation is for taking this class you will learn a lot of great skills. The main thing you get out of this course is the ability to help in dealing with a diving accident should one occur. You will first need to complete the eLearning theory portion of the program. Once you have completed eLearning we will spend one night going over some rescue skills in the swimming pool and then on to the open water to practice some rescue scenarios. You will need a certification in CPR to get the certification, we can help you out with that requirement as well.